SHANGHAI (Reuters) – China plans to launch a yuan-denominated gold fix by the end of 2015 via the Shanghai Gold Exchange (SGE), in a move aimed at giving the world’s biggest bullion producer and consumer more influence over pricing. The first public confirmation made by an exchange official comes after Reuters cited sources in February on the proposal for the fix to be set through trading on the SGE, the world’s biggest physical bullion exchange. “We will be introducing a renminbi-denominated fix at the right moment, we are hoping to introduce by the end of the year,” Shen Gang, SGE’s vice president, said at the LBMA Bullion Market Forum in Shanghai on Thursday. Shen did not give more details, but sources familiar with the matter have said that China is expected to receive central bank approval for the fix soon. 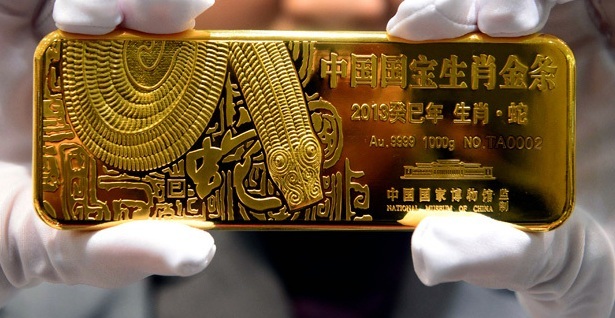 Pan Gongsheng, a deputy governor of the People’s Bank of China (PBOC), said the bank would continue to support “speedy and healthy growth of the China gold market” and its internationalisation. Given its leading role in gold, China feels it is entitled to be a price-setter for bullion and is asserting itself at a time when the global benchmark, the century-old London fix, is under scrutiny for alleged price-manipulation. If the yuan fix takes off, China could compel local buyers and foreign suppliers to pay the domestic yuan price, making the London fix less relevant in the world’s biggest bullion market. However, given the yuan is not fully convertible, the two benchmarks could exist side-by-side globally. China has been making efforts to liberalise the yuan and increase its influence in global gold markets. The Bank of China recently joined the London gold price benchmarking process, the first Chinese bank to do so, while the Industrial and Commercial Bank of China Ltd said it too was keen to join the process. These banks could also join China’s yuan gold fix. The SGE has submitted details of the fixing process, and rules and regulations for participants, to the PBOC a few weeks ago, sources familiar with the matter said. “They may approve it anytime now,” said one source, who declined to be named because of rules on talking to media. After receiving PBOC approval, SGE will work to sign up Chinese and foreign banks. Around 15 Chinese banks are expected to participate initially, the source said. But the yuan fix’s success will depend on the participation of foreign banks, which may be reluctant to join given the global scrutiny of benchmarks following the manipulation of the London interbank offered rate. “It will be hard to join the fix because there are lots of internal compliance issues. It might take months before we get everything done in house,” said a trader from a global bullion bank. In a trial run for the fix in April, some foreign banks participated along with many major Chinese banks. Details of the fix are yet to be revealed, but sources say it would be derived from a contract traded on the bourse for a few minutes, with the SGE acting as the central counterparty. That could make the process transparent – addressing one of the big concerns about the London fix. The yuan fix is the most recent effort by SGE to boost China’s position in the global gold market. The exchange opened an international bourse in September 2014, allowing foreigners to trade yuan-denominated contracts for the first time. Australia and New Zealand Banking Group, Standard Chartered and HSBC are among the members of the bourse.